Thomas Bragg lived in Raleigh, North Carolina during the Civil War. He served as the Attorney General for the Confederacy after leaving the Senate and returning to Raleigh. (Cross) He was exempted from general amnesty on two grounds the first, â€œall who are or shall be have been pretended civil or diplomatic officers or otherwise domestic or foreign agentsâ€ in the Confederate Government, and the fourth â€œall who left seats in the Congress of the United States to aid the rebellion.â€ (Johnson and Seward) Bragg wrote in his amnesty petition to Andrew Johnson on August 15, 1865, that he doesnâ€™t believe the fourth reason for him having to apply for separate amnesty applies to him, but does accept the first exception to general amnesty. Thomas Bragg was a well-known man not only in North Carolina but also among Southern politicians. He was a successful lawyer who then became involved in politics. (Cross) In 1854 Bragg became the governor of North Carolina and won reelection in 1856, in his two terms he â€œsupported internal improvementsâ€ and worked to stabilize the economy. (Cross) The question of secession was one that hovered around his entire time in office. Bragg was a â€œstrong statesâ€™ rights Democrat who â€œobjected to encroachments by the Federal Governmentâ€ but â€œdid not favor secession.â€ (Cross) After serving his two terms and Governor he was then elected to the United States Senate, until the Civil War. (Cross) Like many after the Civil War, Bragg was bankrupt, forcing him to reestablish his law practice. (Cross) He even notes in his amnesty petition to Andrew Johnson that he is â€œadvanced in years and reduced in circumstances, with a large familyâ€¦all dependent on his personal exertions.â€ (Bragg) Once he reestablished his law practice he gained a â€œreputation of a strong defender of constitutional law and personal liberty.â€ (Cross) Leading to him serving on the prosecution team in the â€œimpeachment and removalâ€ of Governor William Holden. (Cross) Thomas Bragg was a man who had a very well respected reputation in the state and had a political and legal career that are both very historically significant. Thomas Bragg was a man very deserving of amnesty in my personal opinion. He states often in his amnesty petition to Andrew Johnson his beliefs that the Southern states had just claims, but that he was not for a â€œruptureâ€ of the government. However, once one did occur he really had no other choice but to follow and support his state. He didnâ€™t serve very long in the Confederate Government, due to what is often described as a dysfunctional government. (Cross) To me the main reason that Thomas Bragg would be very deserving of amnesty is the fact that he took the Oath of Amnesty and Allegiance, but also that he played a large role in restructuring the government of North Carolina. Itâ€™s fair to say that Thomas Bragg was not a fan of the idea of taking up arms against fellow countrymen and that he wanted to see a unified government. He was in favor of compromise and pushed his state to pursue such acts. Thomas Bragg is one of the southern politicians that helped with getting the state of North Carolina back into the Union, and that alone is a very telling trait, and one that is deserving of amnesty. 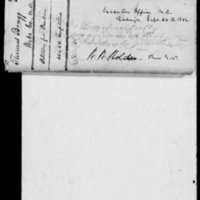 Thomas Bragg, Amnesty Petition, Aug 15, 1865, Case Files of Applications from Former Confederates for Presidential Pardons (â€œAmnesty Papersâ€), 1865-67, Records of the Adjutant Generalâ€™s Office, 1780s-1917, Record Group 94, Publication M1003, National Archives, Washington, D.C.
"In and by the Proclamation of our Excellency of the 29th of May last certain classes of persons are specially excluded from the amnesty therein granted. Two of these exceptions may be supposed to apply to you petitioner. The fourth 'All who left seats in the Congress of the United States to aid the rebellion.' And the first 'All who are or shall have been pretended civic or diplomatic officers or otherwise domestic or foreign agents of the pretended Confederate government.' In the fourth your petitioner does not consider himself embraced. In the first he is embraced. At the time of the attempted withdrawal of the state of North Carolina from the Union your petitioner was one of her Senators in the Senate of the United States having taken his seat therein on the 4th of March 1859. He remained in the Senate during the regular session of 1860-61, was present at the inauguration of Mr. Lincoln and also attended the extra session of the Senate called immediately thereafter remaining some days and taking part in the proceedings...was called home by dispatch informing him of the extreme illness of his wife...It was always that of moderation upon the distracting questions of the day for your petitioner was extremely solicious to ally and not to increase the excitement and to bring about some amicable adjustment of the matters then at issue between the North and the South. Your petitioner was not then, nor had he been in favor of a rupture of the Union...he was called upon to address the people of North Carolina and did address large assemblages of them...The question, whether the Souther states ought to withdraw from the Union in the event of the election of Mr. Lincoln was then freely discussed...It was on every occasion that your petitioner spoke and he uniformly advised against it and opposed it with whatever power he possessed. During the Session of Congress which preceded the rupture and in the midst of the excitement your petitioner was called from Washington to Raleigh. The Legislature of North Carolina was then ins session and he was invited to address the members and did so. He expressed his views and the anxiety manifested for an amicable adjustment. The state of Virginia had then recommended a meeting of what may known of the peace conference. Many of your petitioner's political friends were opposed to it, but your petitioner strongly urged the sending of delegates to the proposed conference. The opinion was almost universal of the south that some additional guantees to slave forfeit out to be granted. Your petitioner honestly thought so...but he then advised the acceptance of what was known as the "Crittenden Proposition" and was sincerely desirous that it or some similar proposition should be accepted in the hope that peace and harmony might be restored. Your petitioner returned to North Carolina from the extra session of the Senate, as he has state, but not with the intent to 'aid the rebellion.' True it is that from the best information he could attain before he left Washington he entertained little doubt of a coming rupture between the North and South. 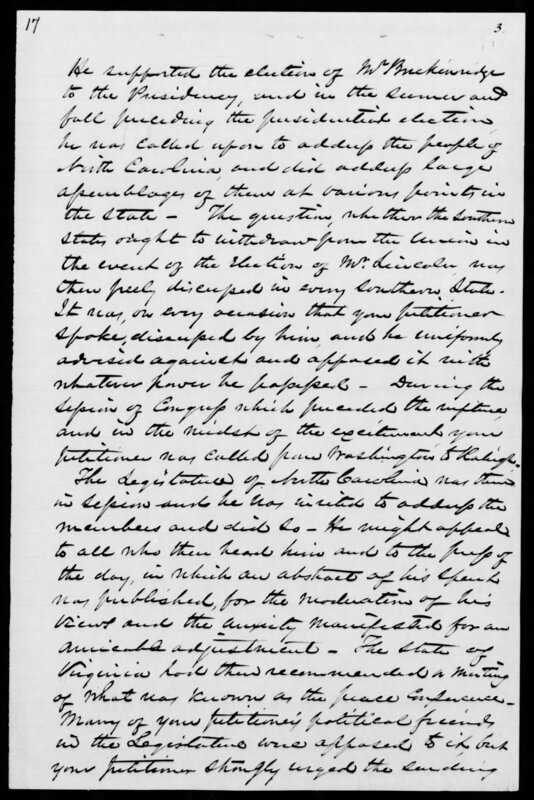 He further believed and so expressed that North Carolina, in such an event would be compelled from her situation to take sides either with the one or the other...He admits that his feelings and sympathies were with the South and that is the contingency he though and said North Carolina should unite with her Souther sisters. He honestly and sincerely believed that the state had a right to withdraw from the Union under the circumstances likely to be presented and that the Government of the United States had not the right to coerce a state thus withdrawing...he hoped that if separation did take place it would be peaceable and without any conflict of arms in this he was greatly mistaken. Your petitioner has admitted that he was obnoxious to the charge of having held offices under the so called Confederate Government while what was call the provisional government thereof was in force he accepted the office of Attorney General under the laws in the Month of November 1861 and continued to act int hat capacity for a little more than four months which he voluntarily retired from the same and returned to private life. Your petitioner's estate is small much less than 20,000 dollars on the 29th of May last...your petitioner finds himself advanced in years and reduced in circumstances, with a large family, a wife and eight children all dependent upon his personal exertions, and five of his children have yet to be educated...he hopes that he may be able to provide for his family and educate his children. This is the greatest desire and this is his intention should it please your Excellency to extend to him a pardon which he now respectfully asks. Cross, Jerry L. "THOMAS BRAGG." Bragg, Thomas (from Research Branch, NC OA&H). Research Branch, NC Office of Archives and History, 2004. Web. 24 Mar. 2014. <http://ncpedia.org/biography/governors/bragg>. Johnson, Andrew, and William Seward. "Johnson's Amnesty Proclamation." Johnson's Amnesty Proclamation. North Carolina Digital History, n.d. Web. 24 Mar. 2014. <http://www.learnnc.org/lp/editions/nchist-civilwar/4807>. Peele, W. J. "Thomas Bragg." Lives of Distinguished North Carolinians. Raleigh: North Carolina Society, 1898. N. pag. Print. Bragg, Thomas, Amnesty Petition of Thomas Bragg, August 15, 1865, Civil War Era NC, accessed April 24, 2019, https://cwnc.omeka.chass.ncsu.edu/items/show/858.